The Alfa Romeo 4C has just hit the streets and already Hyundai has a concept to attack the mid-engined Italian, which is a Porsche Cayman rival. Boy, those Koreans are fast. Hyundai's European design team commissioned Turin-based IED to create something the kids would want to buy and then commissioned 16 students to interepret that into a design, according to Carbodydesign.com. The final version seen in the photos is reportedly what happened when the best two designs were combined. I see some McLaren and Lamborghini going on here, rather than Alfa 4C. But it's not a big car, not much more than 13-feet long and not much longer than the Alfa. Hyundai says it's powered by a 1.6-liter turbocharged four-cylinder making 270 horses. Funny, that's also similar to the 4C's 1.8-liter turbocharged four. 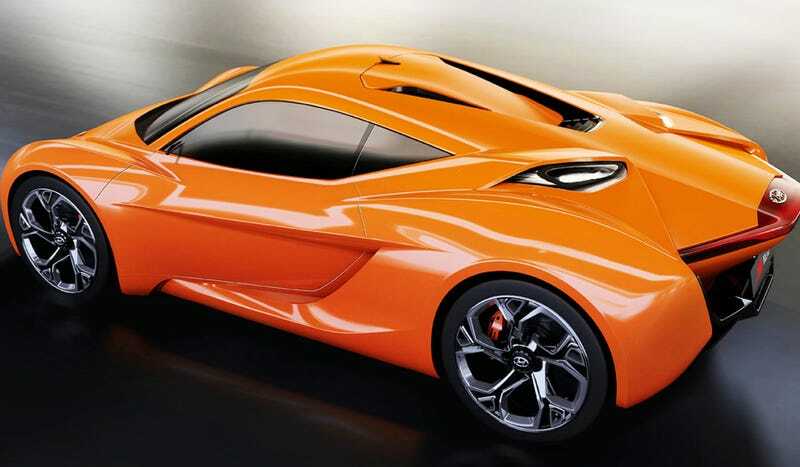 There's absolutely no word if Hyundai is serious about making a 4C rival, but given the seriousness in which corporate cousin Kia presented the GT4 Stinger concept this year, Hyundai probably wants a sports car, too.